"c.madeleine did a wonderful, professional job. I'm very happy with her work and communication level. I'll keep her in mind if I ever need a logo in the future. Thanks, c.madeleine!" "I loved working with Madeleine. She made all changes I requested exactly how I wanted. She understood my vision and made it come to life." "I love my Curvy Carry-On Logo. You are really an amazing designer - the best really! Thanks for your professionalism. xo"
"It was a pleasure working with Madeleine on my logo. Throughout the entire process she was very professional and was the only designer that was actively communicating with me to ensure that my design requirements were met. I would happily choose to work..."
"C.madeleine is simply the best. Don't waste your time anywhere else!" "From the first submission to the handover, c.madeleine delivered excellent ideas, clear communication, and opportunities for refinement (though not much was needed). Our logo fit our company so well that I dispensed with the Final Round and just awarded..."
"Everything was good, madeleine is friendly and she answered contemporary! We would like to work with her again!" 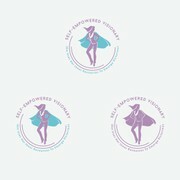 "I could not have been happier with the results of my logo contest and the professionalism of c.madeleine! She was open to suggestions and very responsive. I would definitely work with her again. " "Madeleine has got to be the most awesome designer to work with here on 99designs! Not only is she a great designer, she comes up with great ideas and the files she delivers for the winning design (she will be the winner of your contest) are well laid ou..."
"Madeleine is so patience and understanding! I love her designs because they are so delicate and detailed! Everything that we were looking for on our logo Magic Cakes! It was so good to work with her :) I super recommend her"
"I could not be more pleased with the work c.madeleine did for my brand's logo. She was able to see my vision (which was very particular) and create it to life with such ease. Correspondence was always answered in a timely manner. I HIGHLY recommend c.ma..."
"c.madeleine got my vision very easily. I am thrilled with the outcome! Great designer!" "I appreciate all the effort c.madeleine put in. She was professional and gave great ideas from the start. Also whenever I asked her to tweak anything she did it perfect to my instruction. Very happy with the end result!" "Thanks Madeleine for your consistent efforts in answering my requests to come up with a design for my new business. I am so glad together we made it! Madeleine was very receptive to my comments and made some great creative responses. I would suggest you..."
"Talented designer with perfect ideas for our logo. Very easy to work with and fast to respond to any requests! Made several revisions for us until we got it to be just right! Will absolutely work with her again!" "I can't say enough about what a pleasure it has been working with Madeleine! She is very talented (which you already can see from her work) and extremely responsive to feedback. She responds in a timely manner and has great integrity ~ does what she s..."
"Hi there! I just want to say that when I started my contest I went through all of the artists and invited c. madeleine to my contest. From the very first submission I loved her work! She listened to my feedback and gave me exactly what I wanted! I would..."
"THis designer was an absolute pleasure to work with and truly grasped exactly what i was looking for.Very impressed." "Thanks again for the wonderful logo that incporporated all the aspects neccessary for my company. You did a fabulous job and im excited to use the logo you have designed for me :)"
"C.madeleine has been an excellent designer to work with, she really understood our brief and was very quick in her responses to our requests for some minor changes to get the logo just right. Her approach to her work is very professional and we are del..."
"I love my new logo!Madeleine was a pleasure to work with. It was easy for me to get what i wanted cause she understood the feedbadk correctly and made art. Great work!" "Madeleine has done a fantastic job on a logo for something which is a little out of the ordinary. She has been extremely helpful and responsive, and I highly recommend her. She has taken direction very well but has also been able to expand on a concept ..."
"I was delighted when C.Madeleine submitted a design as I had seen her previous work and loved every one of her designs. As soon as she submitted her first design I knew we had a winner, and she kept submitting variations all equally as stunning! She w..."
"Madeline was incredible! I saw her other folio designs and knew I wanted her to participate in my contest, so I invited her. She really took my feedback from my brief and came up with something creative, orginal and FUN that met all of my needs. She w..."
"Great Communication, easy to work with! " "I was happy with c.madeleine's work from the beginning. It kept getting better and better, and new designs were added to mix it up a little. I am so thrilled with my design and highly recommend c.madeleine's work anytime. Thanks a million"
"Thank you Madeleine for the wonderful logo. I absolutely love it. Madeleine is great to work with, answered all my questions, pleasant and worked hard to understand what I was looking for. I am very happy. Thank you Thank you." "Amazing talent with a unique perspective, engages quickly, breathes in the brief and draws out the best concept ever - thank you." "Madeleine was a pleasure to work with and a true professional. She has great creative flair and is a very capable designer." "I am delighted with my logo designed by Madeleine. Madeleine was very easy to work with and took onboard all my thoughts and ideas." "Wonderful and easy to work with. Understands what people want, follows instructions, while at the same time maintaining a unique and original flair to her work. thank you for everything!" "We love our new logo! C.Madeleine did a great job and was awesome to work with! Highly recommended !!" "C. Madeleine really captured everything I wanted in the logo she created for me. The logo embodied pretty much everything I envisioned. She really took everything I said into consideration. Great designer and her designs are very professional!" "C. MADELINE IS A FANTASTIC DESIGNER AND AMAZING TO WORK WITH!...VERY CREATIVE...DELIVERED EXACTLY WHAT I WAS LOOKING FOR, BUT EVEN BETTER THAN I THOUGHT IT COULD POSSIBLY BE!" "Madeleine did a great job. She listen carrefully our request and was really reactive to each demand for modification." "c.madeleine did a fantastic job on creating the logo that I had in mind. She took in to consideration everything I was about and what I wanted and came up with a fantastic, elegant and fun logo. Take my advise, let her help you! " "Amazing designer! Lovely to work with and made every effort to help and actually did what was asked. I will be back!!" "Loved working with c.madeleine. Extremely talented with a great eye for detail. Quick to answer questions and respond. I highly recommend her." "WOW! Is all I can really say. There was very little alteration needed to c.madeleline's original concept which she submitted. She understood our needs based on a few sentences and was more than prepared to add small bits on to the original logo to showc..."
"A wonderful designer to work with! Understood everything I wanted and put her own unique touch when asked. I received quick feedback and revisions and my business partner and I are very happy with the outcome. Highly recommend and will work with again." "Right from the first draft, we knew that no matter how good the other designers would make their drafts, Madeleine’s design was on a whole different level of excellence. After a few minor refinements, we awarded the Contract to Madeleine so as not to in..."
"Hands down one of the most effective designers we've ever worked with in 16 odd years in marketing and advertising. She absolutely understands female brands. Would recommend her without exception. We're thrilled. " "c.madeleine was absolutely wonderful to work with. She understood exactly what I requested each and every time we conversed and came up with a logo I am extremely happy with and excited to use with my new product. Thank you once again c.madeleine!!!! ..."
"Excellent designer! She did a great job for me. Prompt, flexible, creative and high standards of quality, Madeleine did an excellent job for the 2 logos I picked at the end. Highly recommended!" "C. Madeleine's design was just what I wanted- even though it was not what I thought I wanted at first. She was able to interpret what I wanted simply and elegantly. I love my new logo." "Madeline was incredible. She nailed the design and the vibe, right away. She was open to our notes and returned the edited design very quickly. I would highly recommend using her. As, we will. She is truly great at her craft. Great job!! "